A medicine display in Weriatag canoe house was somewhat mysterious. A woman from another island who was staying on Lamotrek asked for medicine to protect her from ria — a "curse." 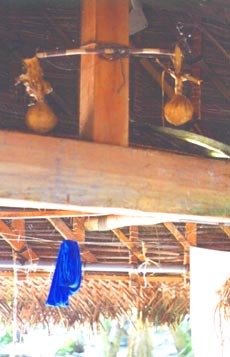 I was unable to determine the nature of the "curse" but pouches fashioned from coconut sheaths with knotted leaves tied to them can be seen attached to the ends of a meshang "taboo marker" which has been hung from the ridge pole ... in effect enforcing a restriction that no person should touch or trespass against this medicine.